It feels like fall is here. The nights are cooler and the kids are back in school. 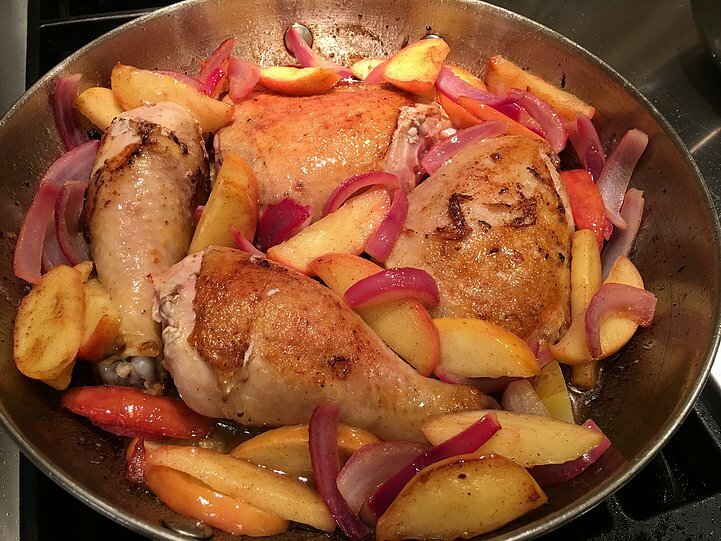 I love this dish, roasted chicken with apples, and cinnamon, and honey. I love more that Ari and I made this meal together! We were inspired by the Jewish New Year which is next week, and the tradition to celebrate with apples and honey for a sweet new year, but this is good anytime. Mix lemon juice and cinnamon in a bowl. Toss with apples. Heat a large oven-proof skillet over med-high heat and add 1 tbs butter and 1 tbs cooking oil. 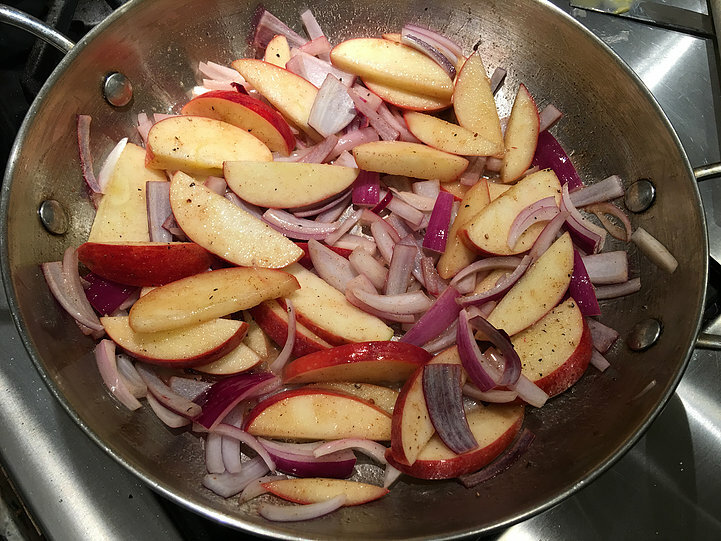 When sizzling, add apples and onions to the pan. Season with salt and pepper. Saute for 5 minutes until soft, stirring occasionally. Remove apples and onion mixture from the pan and set aside. Add 1 tablespoon of cooking oil to the pan and brown chicken skin side down for 5 minutes. Flip to other side and brown for a few minutes more. Remove from the pan and set aside. Stir in chicken stock, scraping up browned bits from the bottom of the pan. Stir in dijon mustard, honey, and herbs de Provence. Combine 1 tablespoon butter (butter should be soft) with 1 tablespoon flour and stir mixture into pan. When all ingredients in the pan are well combined, return the chicken and apple mixture to the pan. Bake uncovered in the oven for 30 min or until the thigh runs clear when pierced with a fork.